Trump Towers Las Vegas opens first tower in March with two restaurants, bar and luxurious spa. Luxury Las Vegas condos at Trump International Hotel & Tower real estate will have access to world class spa and an upscale dining option. 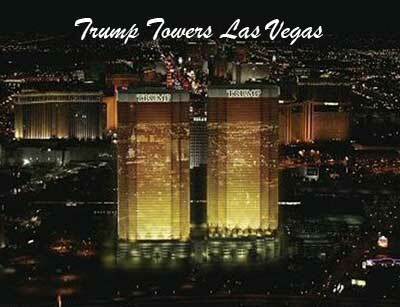 Trump Tower I offers studio units, one bedroom, two and three bedroom Las Vegas penthouse suites. Beautiful view floor to ceiling windows will offer impressive views of the Strip. Some amenities include embedded TVs, marble floors in baths and entries, kitchen granite countertops and vanities with marble countertops. Trump Towers Las Vegas condos are slated for a grand opening March 31, 2008. The gilded condo hotel in Las Vegas, Nevada real estate includes 1,282 units with residents closing on their residences the first part of March. The luxury boutique hotel rental program of Trump International Hotel & Tower will be available to homeowners, which allows the leasing of their units, on March 31, 2008. Trump Towers Las Vegas is nearing finishing of the gold exterior of the luxuy condo hotel. Not only does the exterior look fantastic and rich but so does the lobby. Trump International Hotel & Tower Las Vegas hopes to set a new standard for Southern Nevada. The condominium in Las Vegas, Nevada interior design firm is Design 360 Unlimited. Everything for Trump Towers is handmade and custom. The 7 feet tall and 6 feet wide chandeliers have been designed specifically according to Trump. Each of the three chandeliers will great contain thousands of hand strung Austrian crystals. Trump Waikiki Hotel Condo development by Donald J. Trump and Irongate Capital Partners from Los Angeles real estate has received a $442 million mortgage loan from Hypo Real Estate Capital Corp. The luxury high rise project is known as Trump Waikiki or Trump International Hotel And Tower at Waikiki Beach Walk. Outrigger Enterprises is developing the $1 billion Waikiki Beach Walk development. Outrigger sold the development rights to Iron Gate in 2005. Trump stepped into the project mid 2006.